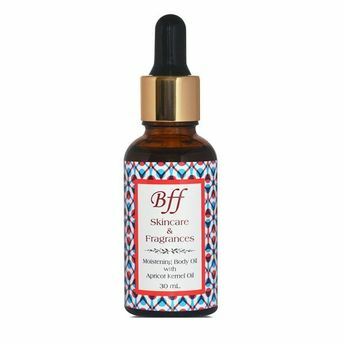 BFF Skin Care Moistening Body Oil is a perfect blend of natural oils, such as Jojoba oil, Apricot kernel oil, and Sweet Almond oil. This formula promotes healthy skin, by providing it the most essential vitamins, fatty acids and nutrients. The skin absorbs this light and non-greasy oil easily and benefits by ease of fine lines, deep miniaturization and relaxation from dryness and dehydration. Apricot Kernel Oil: One of the best oils for skin elasticity. Rich in Vitamin A & Vitamin E, it minimizes fine lines and boosts cellular regeneration. It is very light oil and is easily absorbed in the skin. Almond Oil: A very light oil, loaded with essential nutrients has incredible moisturizing & nourishing ability. Jojoba Oil: Rich in almost all of the vitamins, fatty acids and minerals essentially needed for healthy skin. The Fatty acids moisturizes skin, promotes healing & prevent inflammation.